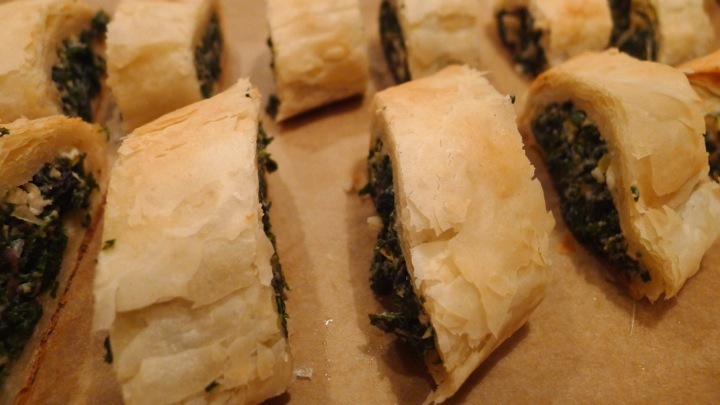 Any time I order Mediterranean food, I always get enough spanakopita to feed a small village. It’s so good!! I’ve never tried making it myself, nor have I worked with phyllo dough, so I figured what better time to try then now. 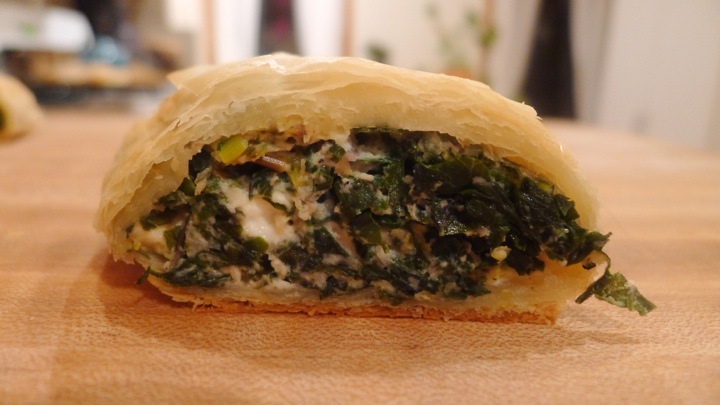 I got some kale and leeks in my CSA bag this week, so instead of making traditional spinach spanakopita I used the kale and added some leeks as well. Overall a pretty good experiment! 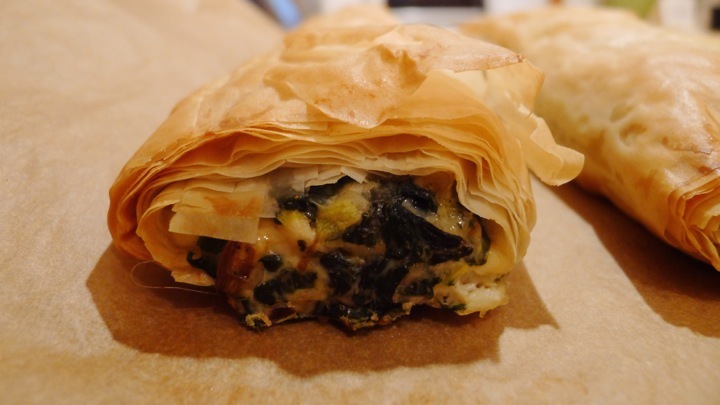 I learned spanakopita is not that hard to make, and phyllo dough isn’t as intimidating as I thought it would be. After eating my weight in these little golden treats, I forced myself to bring the rest to my family before I overdosed in flakey goodness. 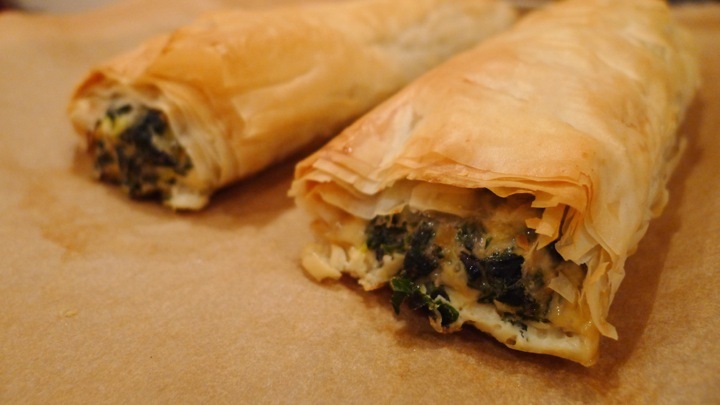 I have another box of phyllo in the fridge though, so I have a feeling I’ll be back on a spanakopita kick soon. Preheat oven to 375 degrees. 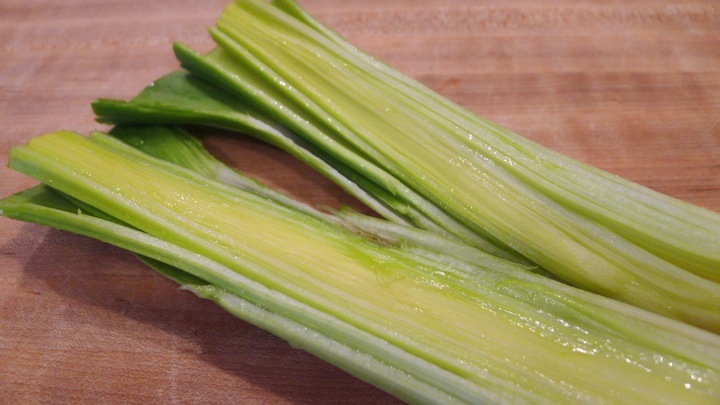 Get a large pot of water boiling going, then add the kale and a pinch of salt. Simmer for about 4 minutes. 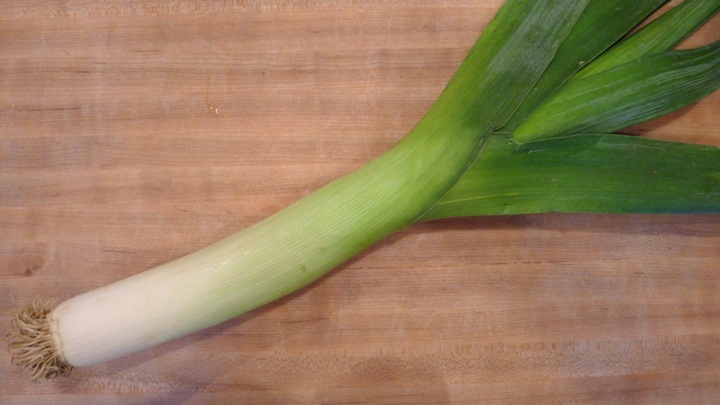 In the meantime, cook the leeks in a pan with some olive oil for about 2 minutes. 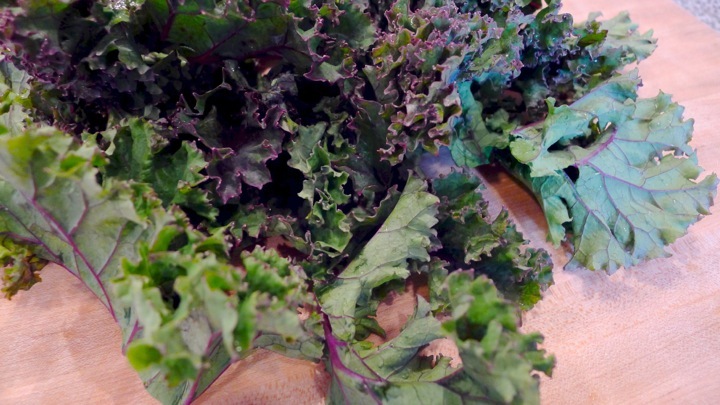 Drain the kale, and when cool enough to handle, squeeze out the excess water. I squeezed mine in a paper towel to make sure I really got out as much water as possible. 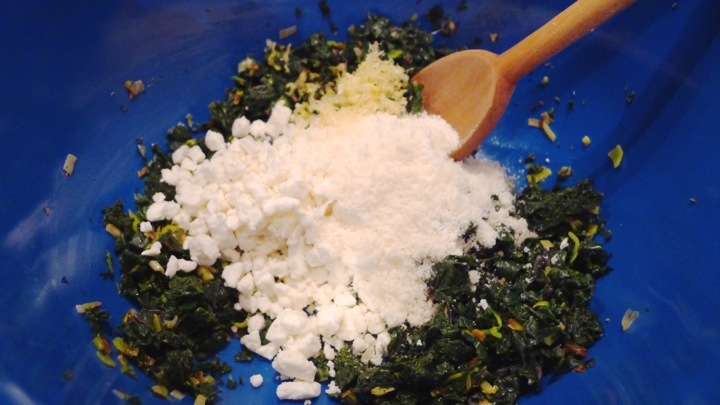 Chop the kale really well and add to a large mixing bowl with the leeks, feta cheese, Parmesan cheese, eggs, and a good pinch of pepper. 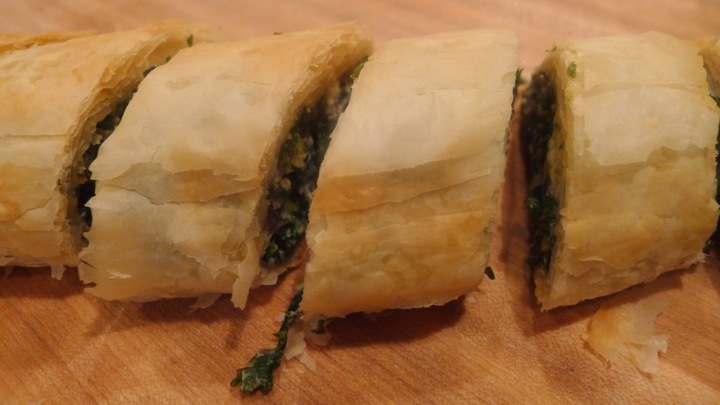 Have your phyllo dough ready to go along with a small bowl of olive oil. It’s important to work fast so that the dough doesn’t stick together. 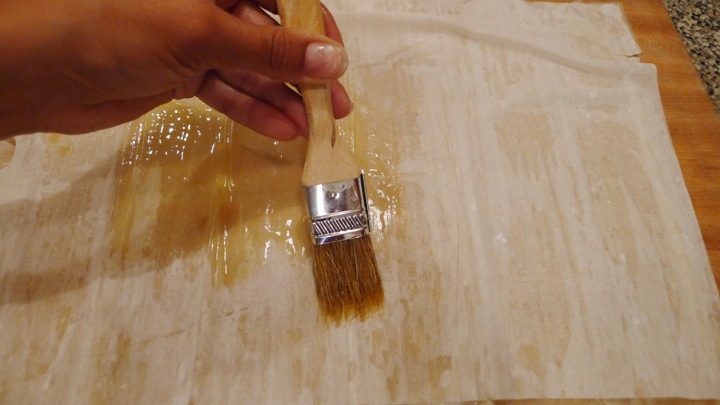 On a large cutting board (or clean counter is fine too) lay a sheet of the phyllo and brush it with olive oil. 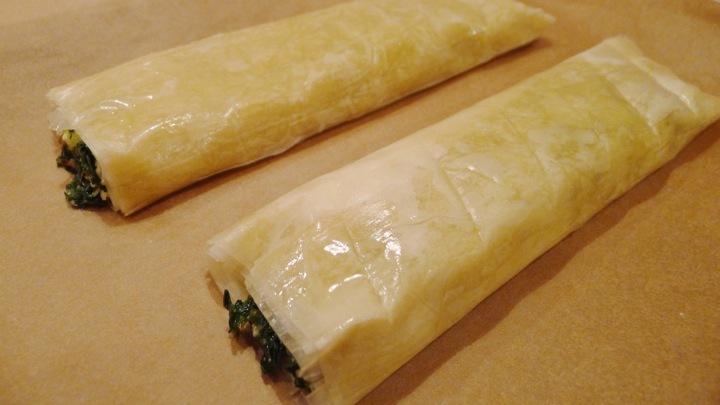 Add another layer of phyllo and continue with the olive oil and layers of phyllo until you have 10 layers total. Scoop about 1/2 of the mixture onto one end of the phyllo (see photo) and roll it up! Place on a baking sheet lined with parchment paper. 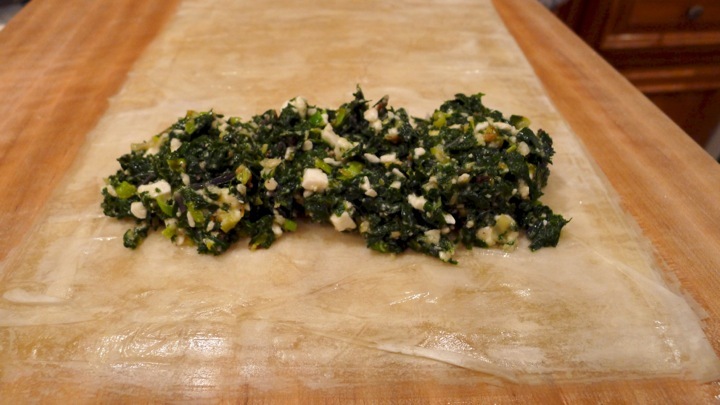 Make the other spanakopita roll with the remaining sheets, then place both in the oven for 18-20 minutes or until golden. 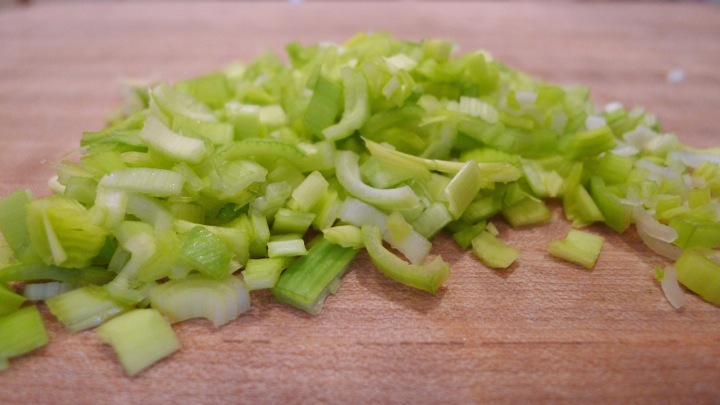 Let cool for at least 5 minutes before you cut them into 6-8 pieced each. EAT!